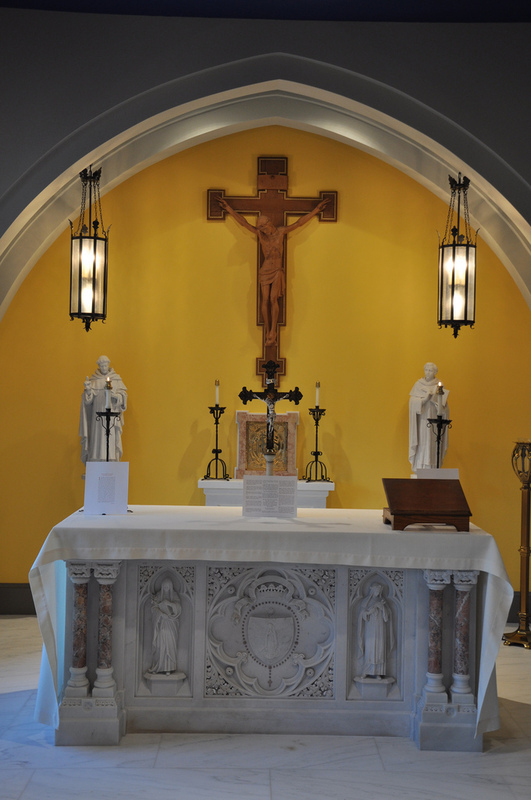 Dominican Rite Instruction in Washington D.C.
Halo Shapes: Round or Triangular? Is There a Place for Modern Art in Our Churches? Recently, the Benedictine monks of the Monastery of San Benedetto in Norcia, Italy (the birthplace of St. Benedict) released a new video showing some of the sights and sounds of their monastic life -- and in very high quality. Readers may recall that these are the same monks who do us the very great favour of daily recording and making available their celebration of the Mass and Divine Office. Please give them your support. This particular piece, which was published in Friday in the National Catholic Register, has been making the rounds over the weekend, so some of you will have no doubt noticed it in other places by now. Still, the piece is important enough for the reason of what it says and the fact that it is a bishop that it is saying it, that I'm going to risk the potential that this will be "old news" for some of you, for the sake of giving this the widest possible dispersion -- lest any of you didn't happen to catch it on any of the other sites and blogs that have linked to it over the weekend. You’ve made public statements about problems with the liturgy. What changes would you like to see? 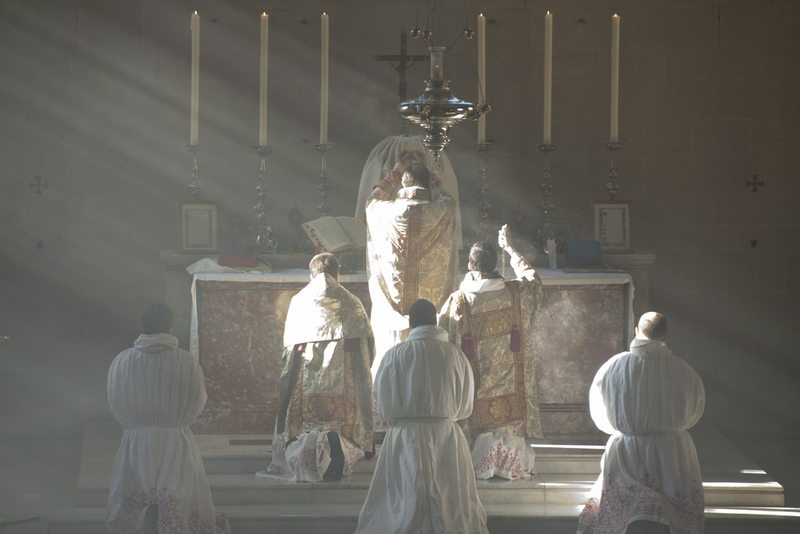 I would like to see the liturgy become what Vatican II intended it to be. That’s not something that can happen overnight. The bishops who were the fathers of the council from the United States came home and made changes too quickly. 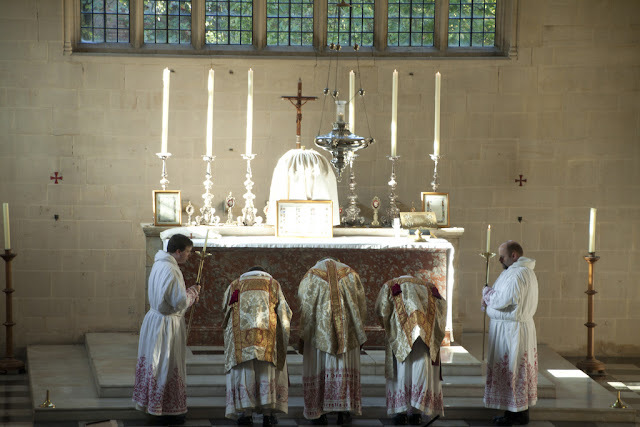 They shouldn’t have viewed the old liturgy, what we call the Tridentine Mass or Missal of Pope John XXIII, as something that needed to be fixed. Nothing was broken. There was an attitude that we had to implement Vatican II in a way that radically affects the liturgy. What we lost in a short period of time was continuity. 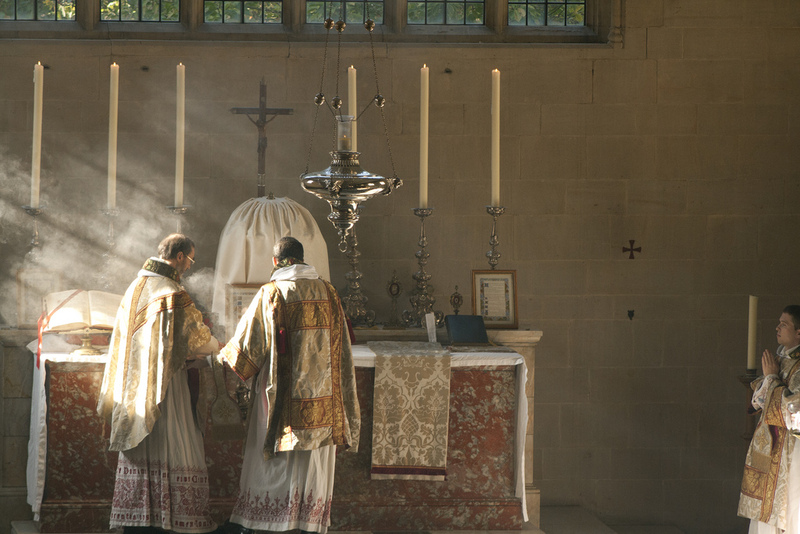 The new liturgy should be clearly identifiable as the liturgy of the pre-Vatican II Church. Changes, like turning the altar around, were too sudden and too radical. There is nothing in the Vatican II documents that justifies such changes. We’ve always had Mass facing the people as well as Mass ad orientem [“to the east,” with priest and people facing the same direction]. However, Mass ad orientem was the norm. These changes did not come from Vatican II. Also, it was not a wise decision to do away with Latin in the Mass. How that happened, I don’t know; but the fathers of the Council never intended us to drop Latin. They wanted us to hold on to it and, at the same time, to make room for the vernacular, primarily so that the people could understand the Scriptures. 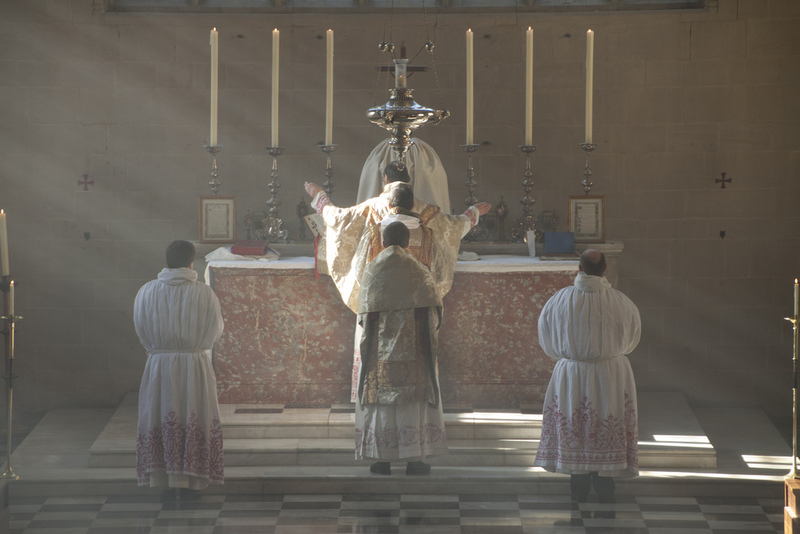 You yourself have begun celebrating Mass ad orientem. Yes, in our cathedral and a few parishes where the priests ask me to. Most of the time, I say Mass facing the people when I travel around the diocese or when I have a large number of priests concelebrating, because it works better that way. A few priests have followed my example and celebrate ad orientem as well. I have not requested they change. I prefer to lead by example and let the priests think about it, pray about it, study it, and then look at their churches and see if it’s feasible to do. And it’s positive when people are thinking about and talking about the liturgy. When people make the liturgy part of their conversation, it is a good thing. 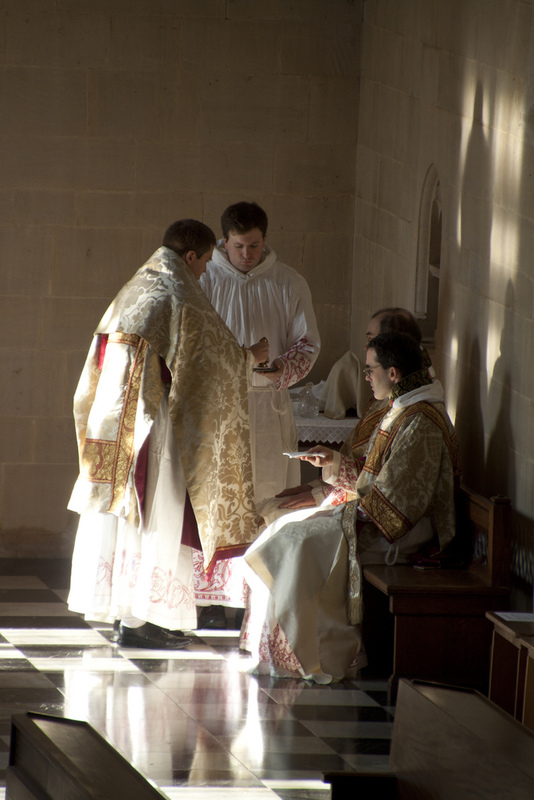 As priests and laypeople discuss the liturgy, they’ll see how important it is and how it is a work of God and not our own. But we must approach the liturgy on bended knee with tremendous humility, recognizing that it doesn’t belong to us. It belongs to God. It is a gift. We worship God not by creating our own liturgies, but by receiving the liturgy as it comes to us from the Church. 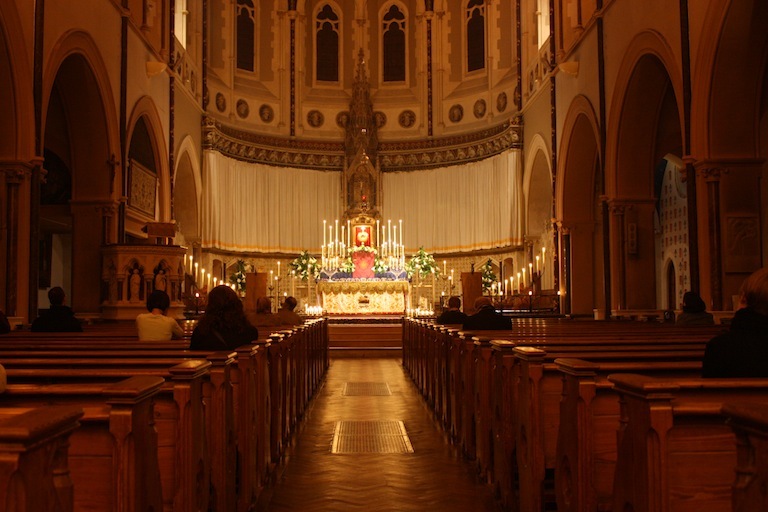 The liturgy should be formed and shaped by the Church itself to help people pray better. And we all pray better when we are disposed to receive what God has offered, rather than creating something of our own. 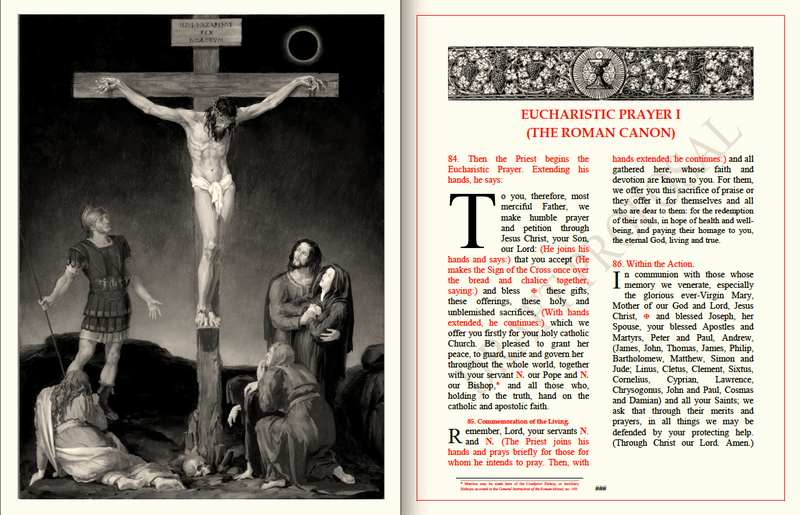 Are you excited about the promulgation of the new translation of the Roman Missal? I’m looking forward to it. I’ve put a lot of work into it this past year: getting the people of the diocese ready. We’ve hosted a number of large gatherings to explain the new translation, and those in attendance were attentive and grateful. I think it is going to be well received by our priests and the people. Moreover, the announcement of the new translation has sparked an opportunity to renew our commitment to an active participation in the liturgy. 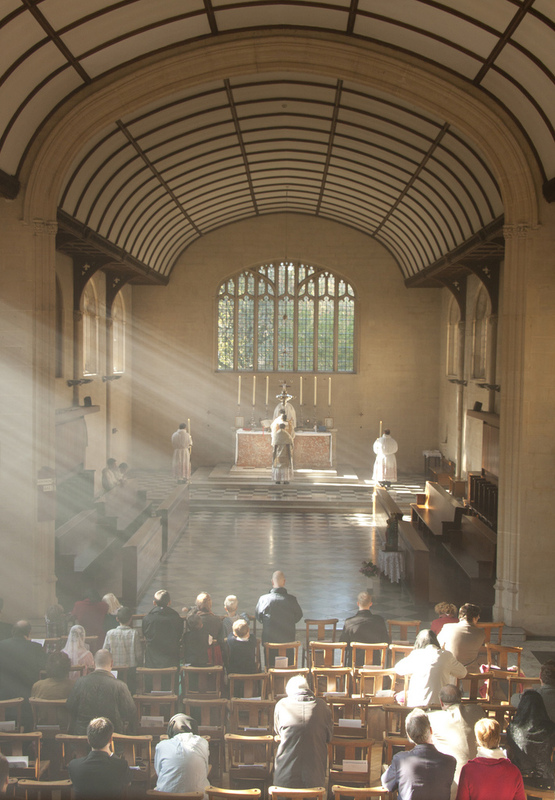 We should come to the liturgy with an interior disposition that it is something which we can only receive. It is a gift from God. And, as part of our reception of that gift, we must listen with a loving heart to what God has to tell us. 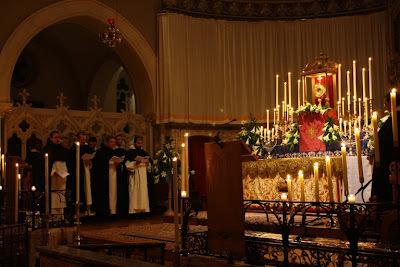 In 2010, to celebrate the fifth anniversary of Pope Benedict XVI’s election, you celebrated a traditional Latin Mass at the Basilica of the National Shrine of the Immaculate Conception in Washington. Why did you celebrate this Mass, and how did it go? I did it because I didn’t want a lot of people to be disappointed. Archbishop [Donald] Wuerl [of Washington], now Cardinal Wuerl, called me to say they could not find a bishop to celebrate the Mass because the bishop who was originally scheduled withdrew. It was only a few days before the event, and they needed a replacement. Since bishops’ schedules are so tight, even Archbishop Wuerl could not do it on such short notice. So, I was thrilled to have the opportunity. I was impressed by the large crowd, but found it easy to pray, despite all the people. There was a sense of prayer, a silence and an involvement that made it easy for all of us to pray together. I am going to make a rare Sunday evening post since we are on the cusp of All Saints and All Souls. There are two reasons related to this. First, to request that you send in your photos and videos and what not after the fact, be it of Sung Vespers and of your Masses, for both All Saints and All Souls. Second, to provide you with an opportunity to use the combox to share your events. Right now I've been rather inundated with requests for such event announcements and these are always difficult to share for this very reason. Off the top of my head I can tell you that I've heard of two celebrations of the First Vespers of All Saints -- which is absolutely wonderful since it is always good to see the Divine Office, and especially public Sung Vespers, assert itself; it is an important aspect of the new liturgical movement. We have already mentioned those occurring in New York in association with Fr. Lang and the Catholic Artist's Society at the church of St. Vincent Ferrer, and we were recently informed that the Brothers of the Little Oratory, in conjunction with Una Voce Orange County, will sponsor Solemn First Vespers of the Feast of All Hallows in the Basilica church of Mission San Juan Capistrano. This will be five-cope vespers in the usus antiquior with the Tomas Luis de Victoria Choir of San Diego will providing the polyphony. And in point of fact, there is the possibility these particular Solemn Vespers are going to be live-streamed. For more info, see their Facebook event page. Una Voce Toronto has also informed NLM of a Solemn Mass for All Saints. Fr. 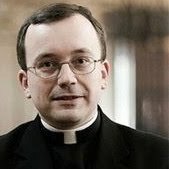 Vincent Kelber, O.P., a co-author of Dominican Liturgy, has asked me to repost here at NLM, his announcement concerning two up-coming events at Holy Rosary Church in Portland, Oregon. The Church will observe the Solemnity of All Saints and the Commemoration of all the Faithful Departed with two Masses according the Dominican Rite. Fr. Vincent M. Kelber, O.P., subprior of Holy Rosary Priory and celebrant of the Masses, invites any readers in the Portland area to attend either or both days and introduce themselves. All Souls Day at 5:30 P.M.
A few of our readers might recall my critique of the Preface of the (optional memorial) Mass for Thanksgiving Day (the fourth Thursday in November), as found in the Sacramentary used in the United States and now approaching the end of its working life. My copy of the new English-language missal arrived yesterday, and I was delighted to find that that Preface has been replaced by something altogether different—and theologically sound. Whether or not my criticisms (originally published in the June 2004 issue of Homiletic & Pastoral Review) had anything to do with it, I will probably never know. In any event, the revision is something for which I am truly thankful. The entrance of this music for the propers from the Simple English Propers strikes me as particularly beautiful. In the Breviary of St. Pius V, the lives of the Apostles Simon and Jude are summed up in a single lesson of fewer than sixty words. It is noted that St. Simon was called “the Chananean, also the Zealot”; the term “Chananean” was thought by some of the Church Fathers to refer to Cana of Galilee, where the Lord turned water into wine, but it is simply a hellenization of the Hebrew word “qanna’i – zealous.” St. Thaddeus, more often called Jude, was the author of one of the seven Catholic Epistles. After the Ascension, the former went to evangelize Egypt, the latter to Mesopotamia; they later met in Persia, where they continued to preach the Gospel and were eventually martyred. The pre-Tridentine Roman Breviary, on the other hand, gives a much more elaborate account of their lives after the Lord’s Ascension. St. Simon is said to have preached the Gospel in many places, which are not specifically named. When St. James the Less was killed by King Herod in 44 A.D., Simon was chosen by the other Apostles to succeed him as bishop of Jerusalem. Having governed the mother church of Christianity for many years, and reached the age of one-hundred and twenty, he was tortured and crucified under the Emperor Trajan. In reality, these stories derive from the life of a different saint with a similar name, Symeon of Jerusalem, who is mentioned by Eusebius of Caesarea (ca. 260-340) in the third book of his Ecclesiastical History. Chapter 11. 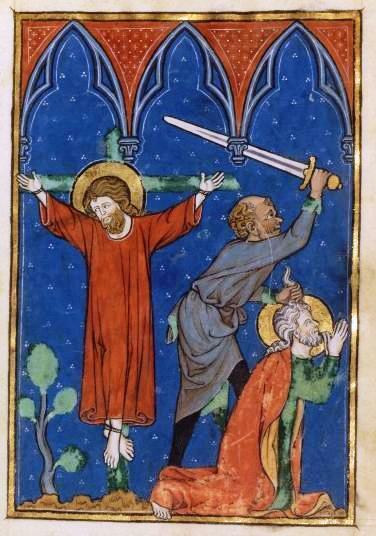 After the martyrdom of James and the conquest of Jerusalem … it is said that those of the Apostles and disciples of the Lord that were still living came together from all directions with those that were related to the Lord according to the flesh … to take counsel as to who was worthy to succeed James. They all with one consent pronounced Symeon, the son of Clopas, of whom the Gospel also makes mention, to be worthy of the episcopal throne … He was a cousin, as they say, of the Savior; for Hegesippus records that Clopas was a brother of Joseph. In his famous Golden Legend, Bl. Jacopo de Voragine writes that the confusion between Symeon of Jerusalem and the Apostle Simon was noted by Eusebius, St. Isidore and Bede the Venerable. In the Tridentine reform of the Breviary, therefore, the error was corrected; the story of St. Symeon of Jerusalem was detached from that of the Apostle, and he was given his own feast day on February 18. 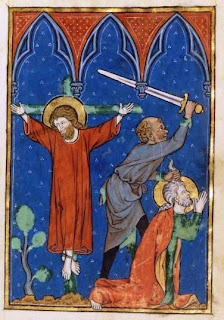 In each of the Synoptic Gospels, when the Evangelists give the names of the Twelve Apostles, Simon and Jude appear together at the end of the list, right before Judas Iscariot; Sts. 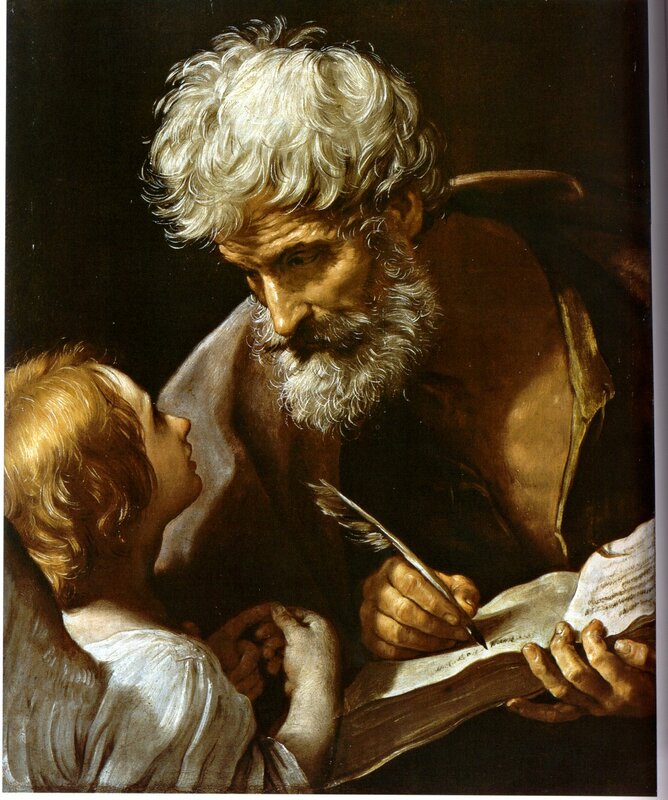 Matthew (chapter 10) and Mark (chapter 3) give his name as Thaddeus, but St. Luke (chapter 6) calls him Jude. St. John does not give a list of the names of the Twelve, but recounts in chapter 14 that Jude “not the Iscariot” at the Last Supper asked Christ, “Lord, how is it, that thou wilt manifest thyself to us, and not to the world?” It with the name Thaddeus that he is mentioned in the Communicantes of the Roman Canon, and by this name he also came to be associated with one of the most beloved stories of the Christian tradition, the legend of King Abgar, and the painting of the Holy Face of Edessa. The Holy Face of Edessa, often called the Mandylion from the Syriac word for the cloth on which the image was made. As recorded by Eusebius in the Ecclesiastical History, (I. 13) King Abgar of Edessa suffered from an incurable disease of some kind; having heard of the many healings wrought by the Lord during His earthly ministry, he sent Him a letter asking Him to come to Edessa and heal him. The Lord replied by letter that He would not come personally, but that after His Resurrection, one of His disciples would be sent to cure him; and in due time, the Apostle Thomas sent one of the seventy disciples, a certain Thaddeus, to perform this office. Eusebius gives what purport to be the text of the two letters, which were kept, he claims, in the public archives at Edessa. The story is repeated in a much more elaborate form in an early fifth-century apocryphal work, “The Doctrine of Addai,” in which the name of the disciple sent to King Abgar appears as Addai, rather than Thaddeus. By the late fifth-century, the so-called Gelasian decree, in the section “on books to be received and not to be received”, (i.e., which may be used in the liturgy), already notes the spurious character of the letters exchanged between Christ and King Abgar. (The decree itself would later be spuriously attributed to Pope Gelasius I, and is commonly called after him.) As is the case with many apocryphal writings, formal rejection did not in the least diminish the popularity of the story, which continued to be embellished in various ways. The Doctrine of Addai simply adds that Abgar’s messenger made a picture of Christ’s face to bring back to the King; by the Bl. Jacopo’s time, the legend states that on receiving the reply of Christ, King Abgar sent a painter to make an image of the Lord’s Face on a piece of cloth. 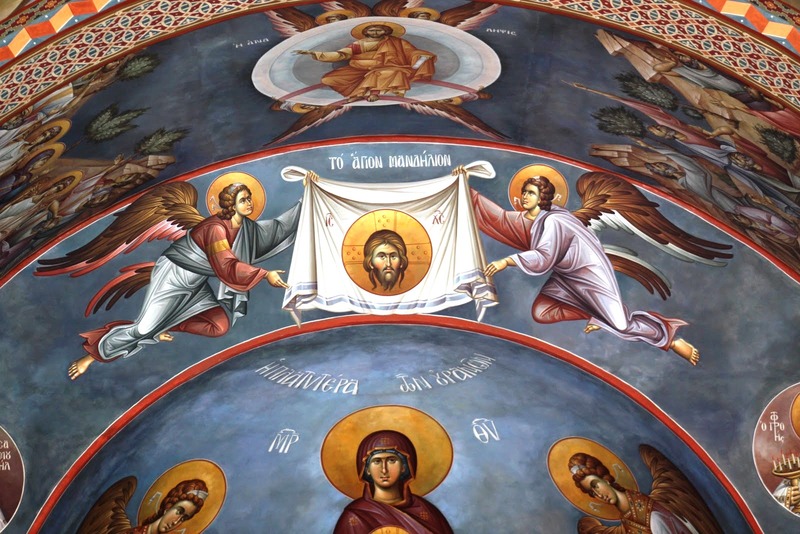 The painter was unable to do this himself, however, “because of the exceeding brightness that came forth from His face”; the Lord Himself therefore took the cloth and laid it over His own face, leaving an impression of the image upon the cloth, which was then taken to Abgar. Among Byzantine Christians especially, the Holy Face of Christ is still to this day the object of great veneration; it is known as the Holy Mandylion, a word which derives from the Syriac “mandil – a cloth.” Although Eusebius clearly says that the Thaddeus of the Abgar legend is one of the seventy disciples, and not one of the twelve Apostles, the Golden Legend and the Roman Breviary of 1529 both identify him with the Apostle called Thaddeus in the Gospels of Matthew and Mark, and Jude in those of Luke and John. Because of the association with the King Abgar legend, he is sometimes shown holding an image of the Lord’s face. 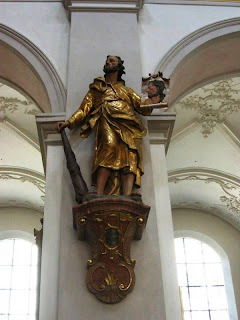 In modern times, a new devotion has emerged to Saint Jude as the Patron Saint of Lost Causes, the origins of which are quite obscure. There are many variations of the following prayer to ask for his intercession, and it is still a fairly common custom to thank the Saint publicly for his intercession by placing a message of thanksgiving in a newspaper. Having provided a general comparison matrix, and having first pursued a review of the Magnificat edition of the newly revised English language edition of the Roman Missal, Aquinas & More is continuing on with their review project, now reviewing the Liturgical Press edition. It’s a busy autumn as the community grows, and we are in the last stages of preparation for the new building. On 29th September Brother Oliver Craddock was “clothed” as a novice, beginning the first of three years of probation to join the Fathers of the Oratory. A recent graduate in mathematics and computer science, he brings new skills to the community, but now has to begin the long and complicated studies necessary for the priesthood. 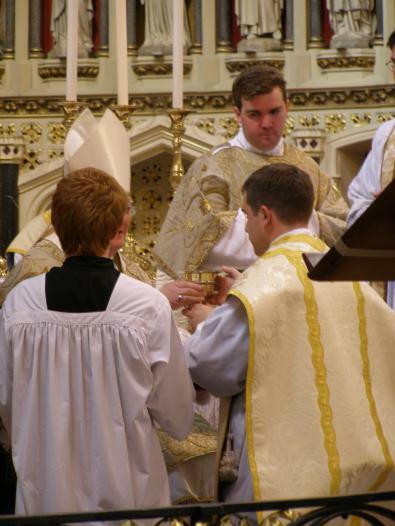 At the other end of the process, Brother Nicholas Edmonds-Smith was ordained priest on Saturday 1st October. Father Nicholas, originally from Cape Town, completed his studies with the Dominicans at the Oxford Blackfriars. The next weekend was Newman’s Day (9th October) – many walked to Littlemore the night before to commemorate the arrival of Blessed Dominic Barberi (yes, yes, we know he himself took a cab), and on the Sunday large crowds gathered to celebrate the Mass of our new Beatus, including a group from Canada and another from the Philippines. 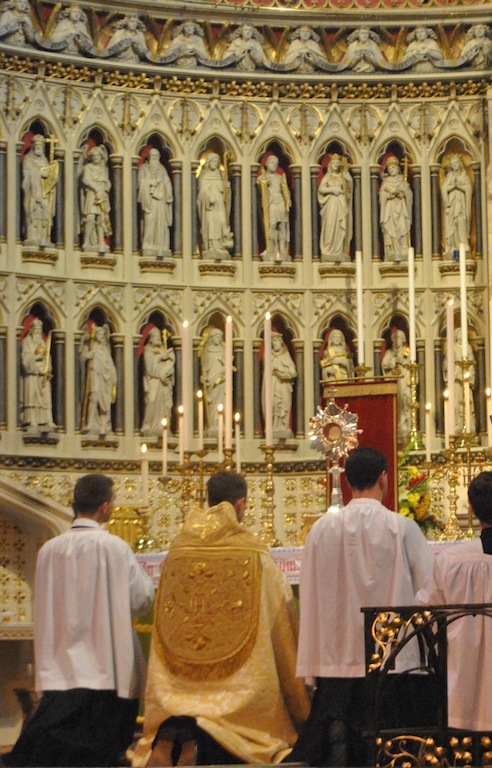 One week more (14-16 October), and we had our annual Forty Hours Devotion (Quarant’Ore) when the Blessed Sacrament was exposed in a sanctuary full of splendour; many prayed all night, many more came during the daytime, to pray for the needs of the Church and the World. The opening ceremony was a full High Mass in the Extraordinary Form, followed by Litanies. Boys and girls of “Young Oratory” spent the Friday evening in church, until at midnight the Dominican Friars came to lead us all in Compline, ending with their own traditional chant of the Salve Regina; before dawn the Sisters of « The Work » came to join us for Matins and Lauds. 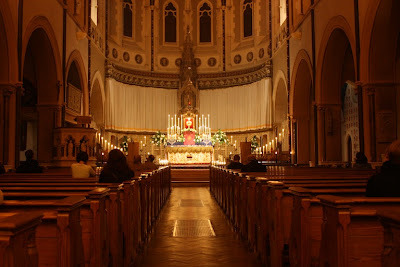 There was an extra Mass at 6:00 am, and all our usual Masses and times of Confession during the days. And all concluded with sung Vespers of the Blessed Sacrament, a Procession and Benediction. Sacristans, musicians, flower-arrangers and masters of ceremonies worked hard to provide an occasion for many to be still in the presence of the Lord. There are now eight priests and the one novice in the Oxford Oratory, sharing a house with eight rooms – so one is having to live in the cellar. This makes it even more urgent than ever to get our new building constructed: it has taken several years to perfect the design, and to go through the innumerable complicated processes required by modern planning laws. Now we have “gone to tender”, inviting contractors to offer a price and a time-scale for the First Phase. That means the accommodation block, providing another five study-bedrooms, and the Library, so that our scattered collections can at last become accessible; beneath that will be greatly improved facilities for parish meetings, catechism classes, study groups, the Secular Oratory and all the many activities that circle around the Church. God willing, the First Phase should start in January, and be completed by the autumn of 2012. The Second Phase will be the great Newman Chapel, the Baptistery and courtyard: it may take a bit longer, for an obvious difficulty has been raising money in the present state of global economic disaster. 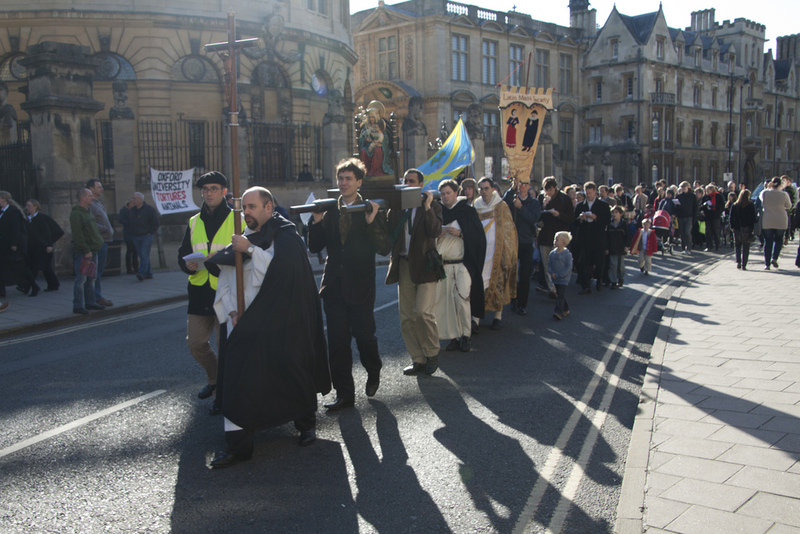 The parishioners who attend Mass regularly at the Oxford Oratory Church have managed to raise an average of two thousand pounds each (over three thousand dollars), which is remarkable when you remember a large proportion of them are under ten years old, and the others have to cope with the costs of bringing up the under-tens! So we look to friends elsewhere to make up the difference. Contributions, which can be spaced out over five years, can be made through “PayPal” or other means, using the “JustGiving” facility which is accessed through our Website. The names of all benefactors are recorded in a book which is placed on the altar during the weekly Mass for Benefactors, although special benefactors will be invited to suggest names for more public commemoration. At present I teach voice in my home studio and have a small schola of high school girls who have been with me for years. Recently, I was asked by the Friars at the Franciscan Monastery in D.C. if my schola - called "I Cantori" would sing once or twice a month at their 10 am Sunday liturgy and become the "regular" choir of the Monastery. I accepted - of course - and consider myself extremely fortunate to be able to serve the liturgy in such a worthy setting with the acoustics of a (well-built) great Cathedral. Here's the point: Last night, in my living room, I took my new copy of the "Simple English Propers" in hand and had "my girls" (ages 12 -14) around me to prepare for Mass this Sunday -- and began work on the Introit and Communio for the liturgy. At previous rehearsals I had explained that we would be starting to sing the Propers and provided them (via email) with brief instruction on why, what and how -- along with a brief history of the place of the Propers in the liturgy. I had also sent them links to the Watershed tutorials on Youtube and asked them to prepare the Introit and Communio for rehearsal last night - if possible. However, I didn't tell them that they'd have to quickly learn how to read neumes or give them any hint that they were going to read the chants in Gregorian notation. Now these girls are dedicated and they have been singing various chants of the liturgy with me for years. However, they are also incredibly silly, talkative, inattentive and all of that--AND, they are very busy, popular girls who are also athletes, actresses, big sisters, etc. I didn't have time to actually plan a detailed lesson for them - we had a good deal of music to rehearse; however, at the last minute I decided to read them the tutorial from the forward of the Simple English Propers as we carefully worked our way through the Introit. The happy denouement is that even with my lack of preparation, the little introduction in the hymnal for the Simple English Propers was perfect. They were able to understand exactly what they were trying to decode, made notes right on their music (at my insistence) and sang the Introit with the purity of angels. Once I gave them a little direction on how to interpret the simple loveliness of the unison line, singing with reverence and care to shape the chant as if they were singing the waves of the ocean (arsis and thesis) - they totally understood their role. They quickly grasped the concept of the differences in the various neumes and remembered which notes had to be sung first and how to group the notes by twos and threes. Then, unexpectedly - within 5 minutes and two iterations of the Introit, I witnessed something very beautiful as they became less of a "choir" and more of a "schola." What do I mean by that? Well, to me, it is the submission of the ego in response to something more beautiful, creative and powerful than oneself -- in service to the ultimate "art form" (for lack of a better phrase) -- the Sacred Liturgy. The chant did what we know it is capable of: it introduced itself to them and taught them how to interpret it IN LIGHT OF THEIR FAITH. I guess what I'm trying to say is that although these girls are already open to the power of the liturgy and they do - for the most part - take their faith seriously, interpreting the Introit somehow matured their faith. I could see it in their demeanor as they chanted and I could definitely hear it in their voices as they were careful not to overpower the delicacy of the "line" as they sang. It wasn't just that they performed the chants with clarity and a purity of sound - there was a humble honesty in their rendering - as if they were beholding an ancient, holy thing that they didn't quite understand - yet compelled them in some silent corner of their faith. I wasn't surprised and yet, I have to say that I was a bit shocked- as one is shocked when one's fervent but hopeless prayer is gently answered -- at the same time that we become aware that - to our astonishment! -- our prayer is in the process of being answered! It was the shock of innocent faith to the disillusioned (me) that a prayer I've held so deeply in my heart of hearts could actually be answered - even though I had "secretly" lost hope. Because for a holy moment in my living room - my girls experienced a transcendence that had nothing to do with how beautiful they sounded and everything to do with how reverent and faithful they sounded. Does that make sense? It has to because it's the truth. Catholic Artists Society and Fr. U.M. 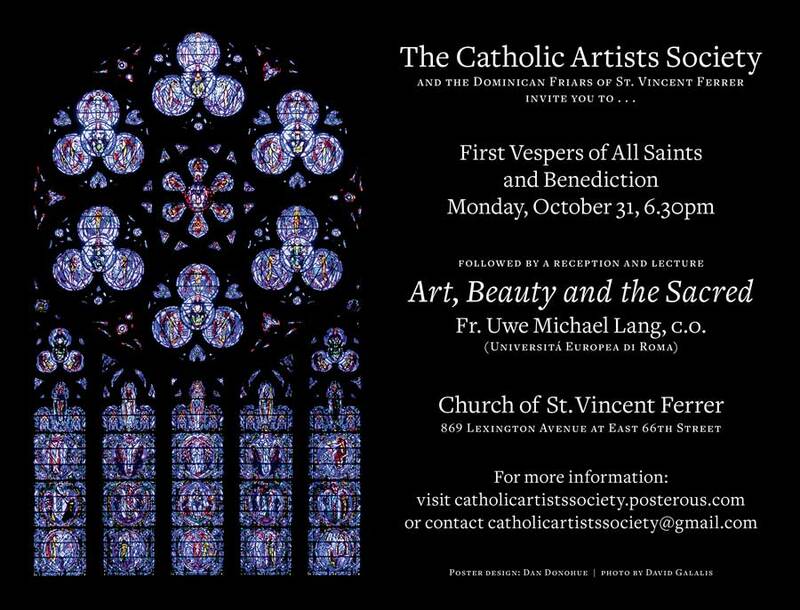 Lang in New York on October 31st: Vespers, "Art, Beauty and the Sacred"
The Catholic Artists Society has announced a rather interesting lecture this coming October 31st at 6:30pm on "Art, Beauty and the Sacred" given by Fr. Uwe Michael Lang. The evening will include the celebration of First Vespers of All Saints in the Church of St. Vincent Ferrer. 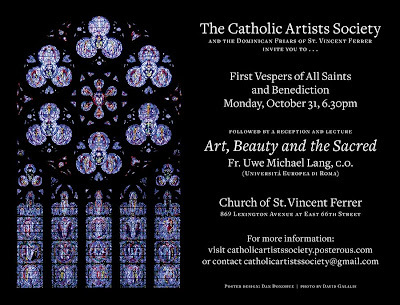 The Catholic Artists Society and the Dominican Friars of St. Vincent Ferrer invite artists, patrons, and friends to a special All Hallows Eve liturgy, lecture, and reception at the parish of St. Vincent Ferrer in Manhattan (Lexington Avenue at 66th Street) at 6.30pm on October 31st, 2011. We will celebrate the ancient and beautiful liturgy of Solemn First Vespers for All Saints, officiated by our special guest, Fr. Uwe Michael Lang, C.O. Father Bruno Shah, OP from St. Vincent Ferrer, and Father Michael Barone from the archdiocese of Newark, will assist in the liturgical celebration. Gregorian chant and polyphonic settings will be provided by a professional choir led by David J. Hughes, Organist & Choirmaster at St. Mary's Church, Norwalk, CT. Following vespers, Fr. Uwe Michael Lang will give a presentation entitled "Art, Beauty and the Sacred." A native of Germany, Fr. Lang is a priest of the Congregation of the Oratory of St Philip Neri in London. He holds a doctorate in theology from the University of Oxford, was ordained to the priesthood in 2004, and worked in parish and school ministry until 2007. He has published various articles on Patristics and liturgical studies, including his bookTurning Towards the Lord: Orientation in Liturgical Prayer, which came out first in German in 2003 with a preface by then-Cardinal Joseph Ratzinger and has since been translated into various languages. Recently, he has edited and contributed to the volumeThe Genius of the Roman Rite: Historical, Theological and Pastoral Perspectives on Catholic Liturgy (Chicago 2010). Fr Lang is a staff member of the Congregation for Divine Worship and the Discipline of the Sacraments and Coordinator of the Master's program in "Architecture, Sacred Art and Liturgy" at the Università Europea di Roma/Ateneo Pontificio Regina Apostolorum. In September 2008, he was appointed by Pope Benedict XVI as Consultor to the Office for the Liturgical Celebrations of the Supreme Pontiff. A social with refreshments and hors d'oeuvres will follow in the church hall. Last week, Fr Thomas Kocik of the New Liturgical Movement visited Thomas More College and gave a brilliant presentation of the liturgical movement since its beginnings in the 19th century. I recommend everyone to watch it. Somehow condensing what had been a 14-part series in his diocesan magazine into just one hour, he managed to give us the detail of the theology that was driving it. He made it interesting and understandable; as he introduced each new piece of detail, he placed it clearly in the context of the overall aims of the movement thereby making sure that we could see how this contributed to the greater picture of the development of the movement. He did the same in describing the errors: both from the over zealous proponents and reactionary forces who saw themselves as preserving ancient tradition (but were often, it seemed, seeking to preserve a misguided innovation of the previous generation of reformers). This portrayal of extremes was epitomised by his description where on the one hand the reformers sought to emphasise liturgical piety to such an degree that all traditional devotional prayer was discouraged - this is one of the things that lead to the removal of statues and iconoclasm of the post-Sixties period; and on the other the promotion traditional devotions to the degree that they are placed ahead of a genuine liturgical piety in importance. He described in clear terms what the second Vatican council said in regard to liturgy and why it was necessary. He went on to say how many of the recommendations were only partially or wrongly implemented, pointing out also aspects that have appeared since the Council for which there appears to be no justification at all. He then presented the current forms of the Mass, Extraordinary and Ordinary into this context. With all of this detail, one might imagine that what was given to us could have been dry and difficult to follow for all but the cognoscienti, but this was not the case at all. The material was so well organised and clearly presented that it was always easy to follow. It was particularly gratifying to see so many of our students, many of whom were hearing this information for the first time, reacting so positively to what they heard. In the period of socialising afterwards they crowded around Fr Kocik to ask more questions. Here is the video of the complete talk, as well as the summation of Fr. Kocik's presentation offered by Thomas More College. Father Kocik's "Singing his Song" from Thomas More College of Liberal A on Vimeo. Fr. Thomas Kocik, a priest of the Diocese of Fall River, MA and regularly contributor to the New Liturgical Movement website, spoke to a packed room of students, staff, and friends of the Thomas More College of Liberal Arts about the 100-year history of the Liturgical Movement. 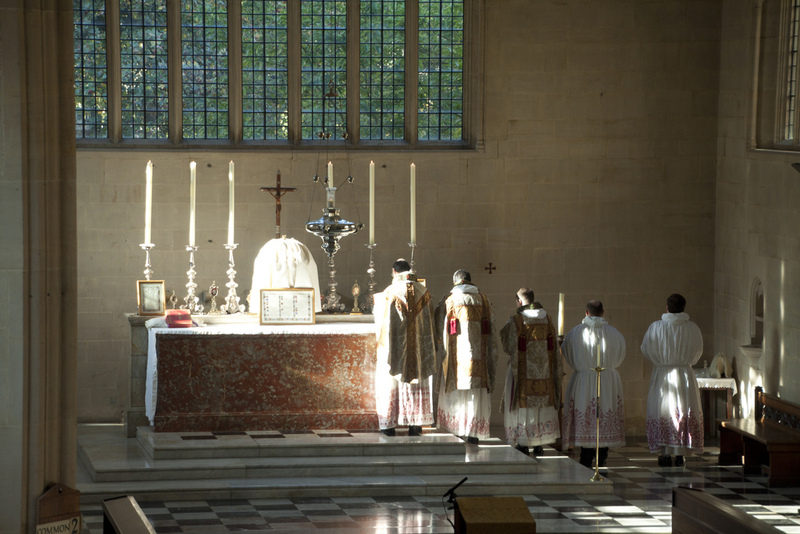 “With Ratzinger’s election to the papacy in 2005, prospects for a new Liturgical Movement looked more promising than ever before. Pope Benedict’s broad approach is best described in terms of ‘continuity,’ that is, recovering elements of liturgical tradition that were hastily abandoned in the first wave of reform. His own style when he celebrates Mass reflects this thrust. He administers Communion to the faithful who kneel and receive on the tongue. Gregorian chant figures prominently. A crucifix stands at the center of the altar to bring home a point he made in The Spirit of the Liturgy: ‘Looking at the priest has no importance. What matters is looking together at the Lord.’ Benedict has even used the eastward-facing altar in the Sistine Chapel, thereby encouraging us to revisit the value of celebrating Mass with priest and people standing together on the same side of the altar, facing the liturgical east of the rising sun, meaning the risen Son who is to come. “Where do you find your own spiritual sustenance? Is it primarily from the liturgy? Do you shape your life according to the liturgical seasons, fasting and feasting with the Church as she celebrates the life of Christ? Does Advent disappear beneath a barrage of Christmas celebrations? Does the Christmas Season end on December 26? Where are you each year for the Paschal Triduum? 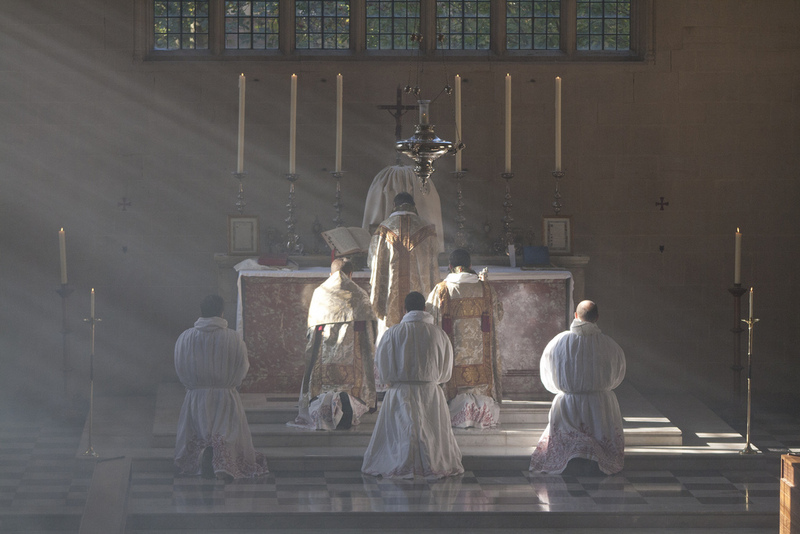 Do you engage your mind and heart with the rites and prayers of the Mass, pondering their meaning? 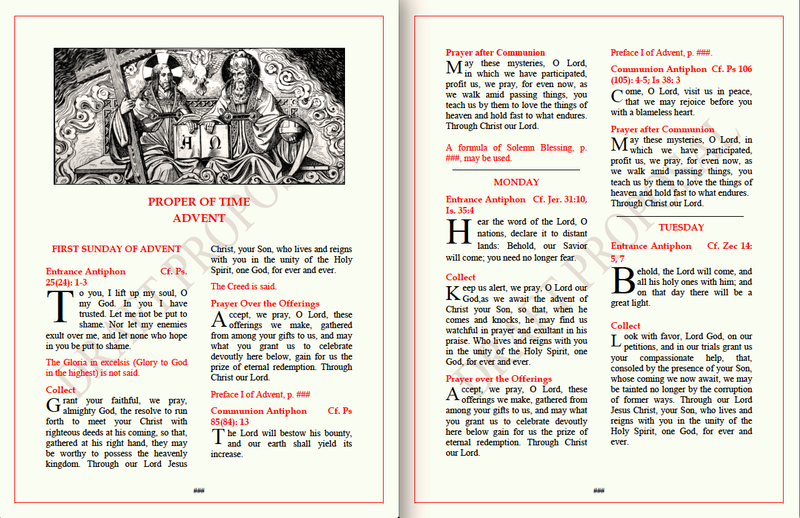 Do you participate in the Liturgy of the Hours where it is available? Could you pray some of the hours at home — perhaps Lauds, Vespers, or Compline — thereby taking up the Psalter, the most traditional prayer book known to the Church, and adding your voice to the sacrifice of praise she offers day and night? Or could you perhaps begin the day with the beautiful Laudate psalms (Psalms 148-150), which in all likelihood formed part of Our Savior’s own morning prayer? Where do you place the emphasis when arranging Baptisms, weddings, or funerals: on the best possible celebration of the liturgy, or on the reception afterwards? "I think this liturgical ‘examination of conscience’ offers at least some ways in which each of us can grow in liturgical piety as well as lay some popular foundations for a new or revived Liturgical Movement. All of these things are possible, and when they become habits, we will start to reap the spiritual rewards of a wholesome liturgical diet. 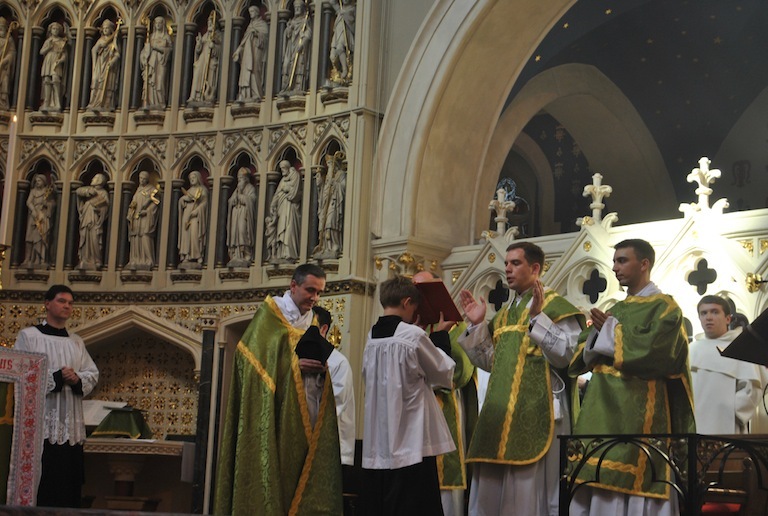 Faith lived as liturgy: that is what the Liturgical Movement was all about." Fr. 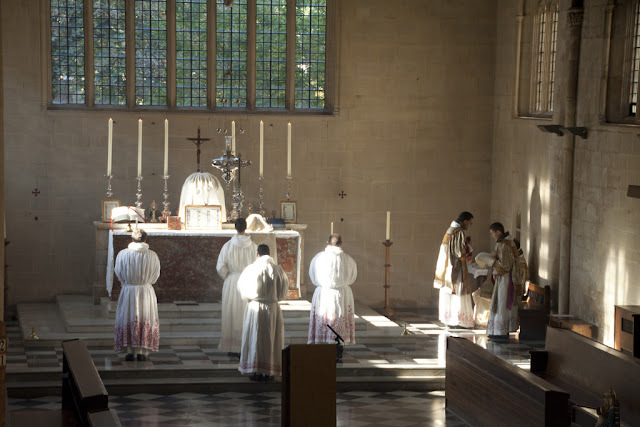 Lawrence brought to my attention that the Dominican rite liturgy was recently celebrated in the Dominican house of Blackfriars in Oxford as part of the annual Latin Mass Society pilgrimage in honour of Oxford's Catholic martyrs. The celebrant was Fr. Richard Conrad, OP, the deacon Fr Thomas Crean OP, and subdeacon Br Gregory Pearson OP. The photos come from Dr. Joseph Shaw. 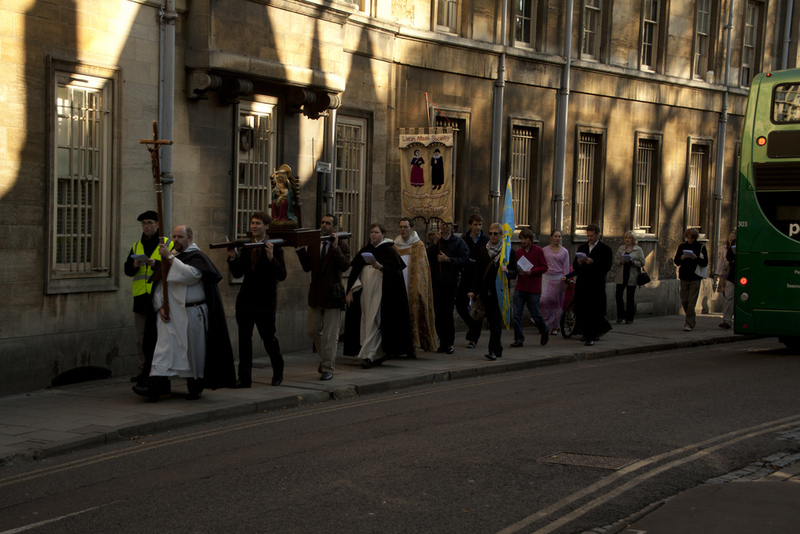 Here are a couple of images from the procession through the beautiful streets of Oxford. 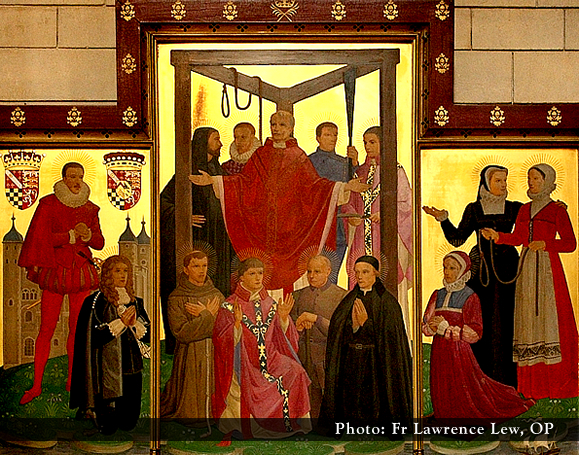 On 25 October 1970, Pope Paul VI canonized the Forty Martyrs of England and Wales. The English saints are truly remarkable and have set a extraordinary model for our imitation. We should also ask their intercession. Composer Jeff Ostrowski has included four complete Mass settings in the Vatican II Hymnal, and each is dedicated to one of the English Martyrs (see below). Also of note: a video production company called Mary’s Dowry Productions has recently come into being, and is primarily dedicated to producing fantastic videos about the English Martyrs. With regard to musical settings of the Mass, the parts of the Mass Ordinary are very short and do not represent a serious challenge for the composer, with the exception of the "Glory To God," which is a longer text and requires structural considerations. 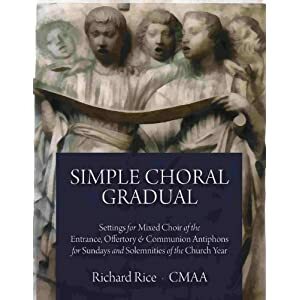 In particular, the new ICEL translation of the "Glory To God" has proven to be very difficult for many modern composers to set if they do not choose the Gregorian settings as their model. Included below are five examples of the "Glory To God" taken from the Vatican II Hymnal. My father wrote music consistently and constantly. In my earliest memories, that is what he did and I took it for granted. Over many years I began to realize he was someone quite special in musical terms. 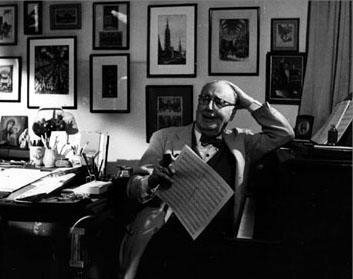 In the last few years of his life we became very close friends and so often he raised the question of what should be done and what would become of his life’s work, the over eight hundred pieces of music, some in manuscript, some little more than preliminary ideas. In my blithe ignorance, I promised to take care of everything. It has been a learning experience that I cherish: the publishers now my friends, the publishers who have to be reminded of their contractual obligations, publishers who let works go out of print, out of circulation and neglect to let me know, perusing the Berne Convention and the Ilsley report. Now after more than forty years I was beginning to ask myself the same question. Who would look after his legacy of enduring works? After all, violinists have their Paganini Variations still in print, and organists have the Willan Introduction, Passacaglia and Fugue, but how about the motets used around the world, O Lord Our Governour, the only Homage Anthem commissioned for a coronation not written by a British resident, the music for Tenebrae and so many other significant masterpieces, the Requiem begun a century ago, left unfinished, and with modulations unheard of until Benjamin Britten wrote similar works many years later, or his opera Deirdre, which seemed a bit dissonant when it was performed in 1946 but now sounds right? So it was a delight and an answer to prayers when two very modern angels flew down out of the sky, Father Scott Haynes of St. John Cantius and Joseph Phelps, a musician angel and a lawyer angel, and there couldn’t be too many of those. They spoke of stewardship, of data based technology for making the work I had been doing with pen and a little computer into a great compendium of knowledge, order, permanence and accessability, a tribute to the composer about whom I have read is a natural successor to William Byrd, 1543 – 1623. Since a majority of his works were written for the service of the church, some people who never knew him, suppose he was a solemn, retiring individual. Such is not the case at all. He laughed uproariously and frequently chuckled. He loved a good story and told them well. He loved all creatures great and small. Particularly dogs. Once he admonished our fox terrier to leave the birds in the garden alone and she got his message although she quivered when sparrows came enough for his crumbs. He loved cryptic crossword puzzles and could make words rhyme in unusual ways. I must have asked him once to put some harp parts in something because he demurred saying that harp solos reminded him of angels picking their teeth. You never knew what to expect but it was usually hilarious. He once described some rather pedantic piece as like taking a reluctant puppy for a walk on a rubber leash. Even when conducting his choir in the most solemn music, there was an energy, a passion, a drive, that never allowed what he referred to as lugubriance. He despised the habit of dragging the tempo at the ending. There is always joy in his music, a statement of deep faith. At a meeting of the American Choral Directors Association in Kansas City years after his death, a group of American directors and I chatting together were asked by Canadian Robert Cooper, if they could name three Canadian composers. Two were easy but then there was a silence. I asked if they had ever heard of Willan. They all said, “O course!” and then one added, “you don’t think of Willan as a Canadian any more than you think of Bach as a German.” I hope my father was listening in. He would have loved it. So there it is, as he would say, Healey Willan’s legacy entrusted to St. John Cantius for all time under Father Scott Haynes direction. I hope and think my father’s question is finally answered and that he is content, all that I could possibly ask. Here is a live recording, recorded in 1966 when he was 86 years of age, of an organ improvisation of Willan, played by him at the church of St. Mary Magdelene in Toronto, Canada, along with his composition of Ave Verum Corpus. 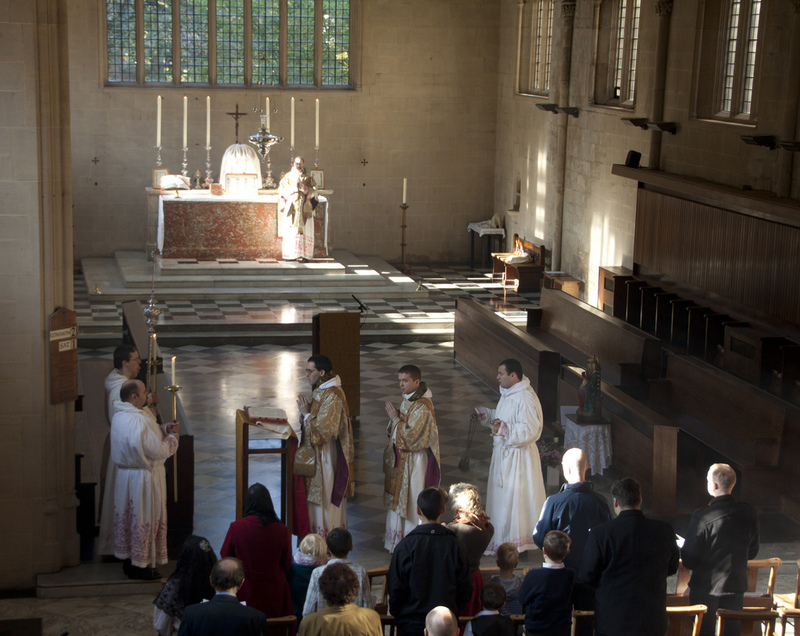 Further to our post last week about the Association of Latin Liturgy conference held at Fr. Ray Blake's parish of St. Mary Magdalen, which saw the participation of Msgr. Andrew Burnham and Deacon James Bradley of the Personal Ordinariate of Our Lady of Walsingham, I noticed by way of Fr. Blake's site that they've done a three minute video recap of the Mass which gives a bit of a sense of the "sights and sounds" of the sacred liturgy celebrated there that day. (And a well produced video it is I must say.) Incidentally, our musically inclined readership might well take note of the "Parish Book of Chant" in use in the pews. The Second Vatican Council produced no Missal itself but merely a careful permission for one to be developed at some point in the future, with no changes permitted that were not to the good of the Church. We know how that turned out. The interim Missal that came out in the United States was a quality product but a bit unstable, and hardly anyone believed that it would last very long. Sure enough, by 1969, a commission had produced the hoped-for new product, one that yielded coincided with, and assisted in causing, what is probably the largest upheaval and decline in Catholic institutions ever found on record. 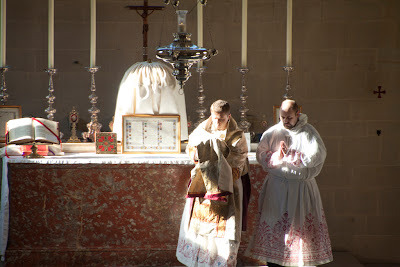 I’ve told the story many times of how it suddenly dawned on me a little over one year ago that we really didn’t have anything to offer parishes that stood somewhere between the perfection of the ideal in the Graduale Romanum and the parish reality of four songs of non-liturgical text per Mass. So long as that was true, progress would be stopped simply because it is nearly impossible to leap from one to the other. You need musicians, training, experience, a pastor who is on board, and a people who are ready - ingredients that rarely come together all in one parish. Keep in mind that what has inspired all of this is the new translation of the Missal. Most of all, it represents good faith on the part of the decision makers in the Church. No, the process was no perfect and it was even extremely messy at times. But the result is there for anyone to see. We will soon experience it - Advent I can’t come too soon. The results won’t be immediate but over time we are going to see the rebuilding process start to take shape. 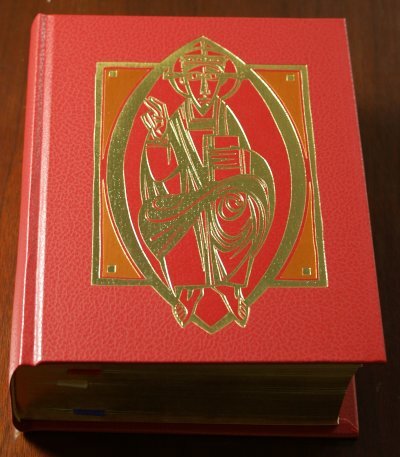 Being interested in liturgical book binding, layout and design, I have been very interested to watch as the new editions of the English Roman Missal have come out. We have seen some very good results in some instances, particularly as some more traditional elements have re-asserted themselves again in some of these editions. That said, I think there are still further opportunities (though they do require the appropriate ecclesiastical permissions and approvals since missal production is not merely left to the private determinations of publishers -- and no doubt rightly so). Rather than simply trying to describe that of which I speak, I thought it might be more effectual to put the proverbial pen to paper and actually produce my own design proposal. To do so I took a few pages from two parts of Roman Missal to serve as a template, using the new revised English translation of the Roman Missal. As you will see, the idea that informs my own proposed design is one which really just takes its inspiration from our Latin rite Missal tradition (indeed, one wouldn't be far off to say that these designs are just those which have been seen in liturgical books for a very long time, applied now to the present liturgical books of the Ordinary Form of the Roman rite). In that regard, one could say that "continuity" with that Missal tradition was a driving factor, but so too was beauty more generally (through art, artistic flourishes and layout -- again, all taking inspiration from that tradition). To this I would also add, however, that such a proposal also has the benefit of being a more economic use of the printed page, thereby requiring less printed pages (which thereby also makes it more “green”), and, on a practical level, would require less page turning on the part of the priest during the course of the celebration of the Mass. The key components which I would highlight in this design are the use of two columns with justified text, the use of drop capitals and in different sizes in proportion to where they are being used, the use and placement of the artwork, and page borders. I say more on each of these elements in the PDF below. There too I also give some thoughts on some other additions to this, include the matter of the inclusion of the Latin Ordo Missae. With that, here is the more detailed explanation and consideration of the proposal. by Fr. Benedict Croell, O.P. On October 19th and 20th, Fr. 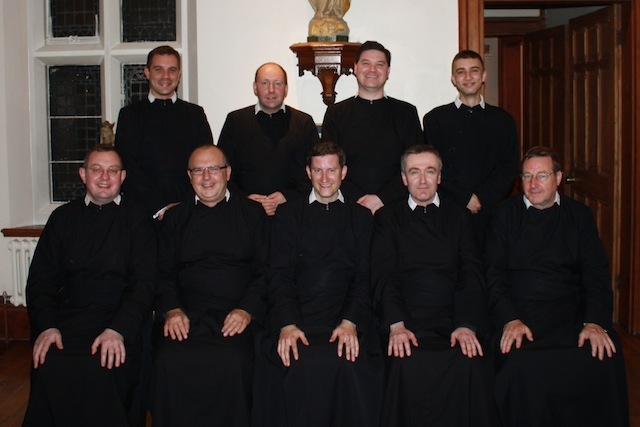 Pius Pietrzyk, O.P., offered several training sessions for the celebration of the Dominican rite at the Dominican House of Studies in Washington, DC. 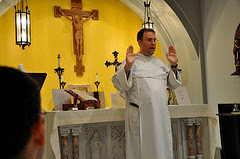 The training sessions included demonstrations of the words and gestures of the priest and server for the private form of the Dominican rite, known as the Low Mass. During the presentations, Fr. 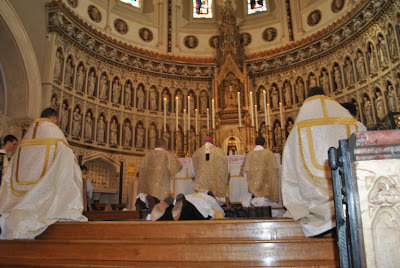 Pius emphasized the pastoral dimension of learning to say the Dominican rite in order to respond to the legitimate requests of the faithful for the celebration of the Extraordinary Form of the Mass. In addition to the formal training sessions, the friars had the opportunity to participate in the Low Mass. 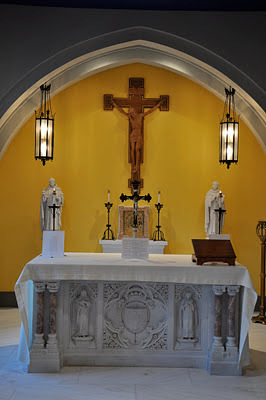 To learn more about the Dominican rite, you may view a Dominican Rite Online Tutorial, which presents videos and texts which explain the celebration of the Dominican Rite, or read a Q&A on Universae Ecclesiae and the Dominican Rite, or sample the other postings at Dominican Liturgy. Watch the whole slide show by clicking on the title or here. 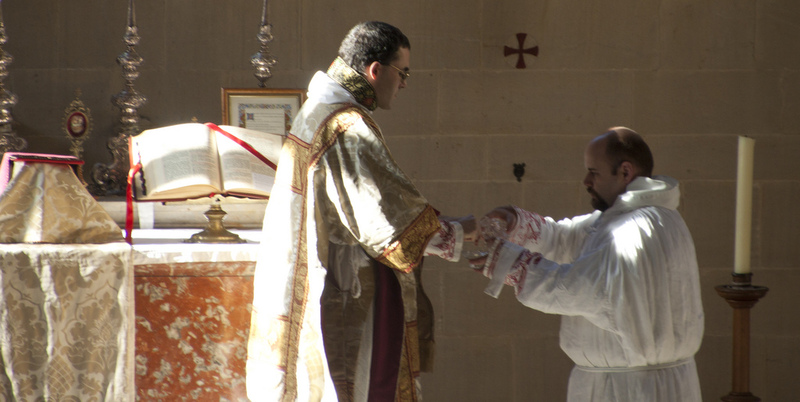 Watch the Dominican Rite Slide Show by clicking on the title or here. When I was learning to paint icons I was taught that the halo is not simply an arbitrary symbol, but rather a direct representation, albeit stylised, of the uncreated light shining from the saint. 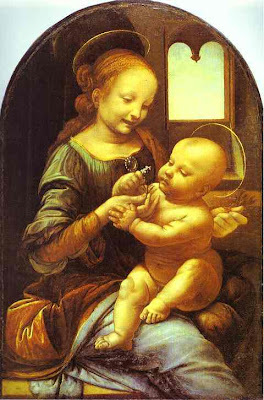 This immediately raised the question in my mind as to the validity of some halos I had that were in the form of a detached floating hoop, as we might see in a Raphael or a Leonardo (whose painting is shown below). Although clearly derived from this original idea, it's form had drifted so that it could no longer be seen as uncreated light, but rather an abstract symbol. Initially, my reaction was to argue that this form indicated a lack of understanding of what the halo really is and should not be used. Then it occured to me that given that the art of the High Renaissance and Baroque is aiming to portray historical man (and not as with the icon eschatological man united with God in heaven), what the artists are doing might in fact be consistent with this. One might propose that because the aura of uncreated light, the nimbus, would not be as visible (to the same degree at any rate) in fallen man, even if that man is a saint. So it would seem that the artist might choose not to portray a halo very faintly, as a slight glow, or even not at all; or else to indicate sanctity with a symbol derived from the heavenly sign. We see each of these possible avenues in the art of the 16th and 17th centuries. As a complication to this, recently I became aware of different shapes of icons in both Eastern and Western traditions. 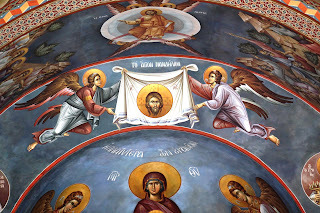 I was giving a lecture at Thomas More College about the portrayal of the Trinity in art and one of the students asked about the triangular halo in this example of an iconographic fresco of the Trinity at a monastery in Mt Athos. I hadn't really thought about this before and guessed that it was an indication of the Trinity but couldn't really account for it with any certainty. Then, the next slide up in the lecture there was a Velazquez with the same triangular halo portrayed as a detached floating triangle on the same person of the Trinity, God the Father. Later , when digging around a bit to find an explanation I found this site, which gave lists of many different halos, here. This listed quite a number of traditional halo shapes, most of which I had not been aware of. While not always showing a clear understanding of the Catholic view of things, this is good resource, I think, not to say unusually attractively presented for a website. So there are two different considerations that come out of this. First, in more naturalistic traditions, should it be retained. And second, should we change the shape of the halo in different situations? 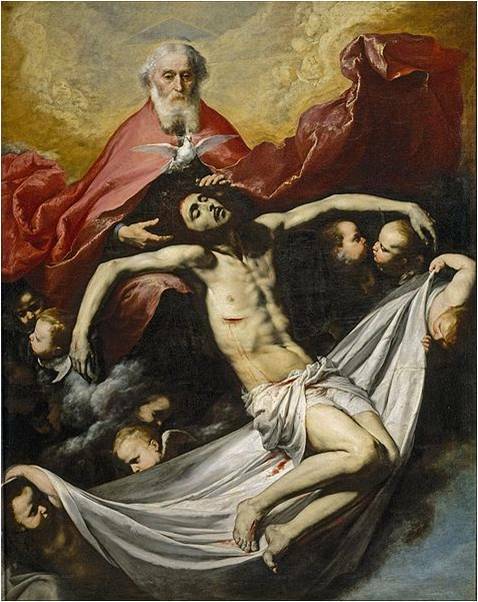 My opinion on the first is that we can happily follow the example set by the Masters of the Baroque tradition and employ whichever solution of the three list the artist prefers, for each, it seems to me, is consistent with the theology. In regard to the second point: for me the debate is similar to that in regard to all the traditional symbols. Symbolism is only useful if it helps to communicate truth. If only a few understand it, it does the opposite, it mystifies. We have to consider this when considering whether or not to resurrect a symbolic language of the past. So if the symbolism is intuitively obvious then it might be worth using; otherwise we would need a huge job of education just to get people to recognise it. This effort would be to great to make it worthwhile, I suggest, except where that symbolism is drawn directly from scripture. In regard to triangular halos: it is not drawn from scripture - I am not aware, for example, of Ezekiel describing visions of triangular halos; but you might say that when placing a triangle over God the Father, in these examples shown, because the known symbolism of three, that it is to large degree intuitively obvious what it is saying, so for this reason might be worth using. In my own case, while I would not object to any other artist using a triangular halo for the reasons given above, I think am going to keep it simple stay pretty simple on halos: a gold disc for eschatological man, and no halo for historical man. This is just a personal choice based upon what I feel looks best. Above: a triangular nimbus. Below: the halo represented as 'floating' triangle or disc in Velazquez and Leonardo in more naturalistic styles of Baroque and High Renaissance respectively; and Guido Reni's St Matthew portrayed without halo of any form.